WAITE: Contentment, repose of the entire heart; the perfection of that state; also perfection of human love and friendship; if with several picture-cards, a person who is taking charge of the Querents interests; also the town, village or country inhabited by the Querent. Additional meanings: For a male Querent, a good marriage and one beyond his expectations. Reversed: Repose of the false heart, indignation, violence. Additional Meanings: Sorrow; also a serious quarrel. MATHERS: The town wherein one resides, Honor, Consideration, Esteem, Virtue, Glory, Reputation. Reversed: Combat, Strife, Opposition, Differences, Dispute. 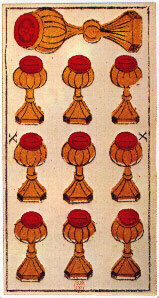 Illustration (above): Ten of Cups from the Tarot de Marseille par Nicolas Conver (1761), republished by Héron. Click the image for a larger one. ETTEILLA: Town, City, Homeland, Country, Market Town, Village, Place, Site, Dwelling Place, House, Residence.Citizen, Citizenry, Town Resident. Reversed: Wrath, Indignation, Strife, Irritation, Rage, Anger, Violence. WAITE: Concord, contentment, physical bien-être [well-being]; also victory, success, advantage; satisfaction for the Querent or person for whom the consultation is made. Additional Meanings: Of good augury for military men. Reversed: Truth, loyalty, liberty; but the readings vary and include mistakes, imperfections, etc. Additional Meanings: Good business. MATHERS: Victory, Advantage, Success, Triumph, Difficulties surmounted. Reversed: Faults, Errors, Mistakes, Imperfections. ETTEILLA: Victory, Success, Attainment, Advantage, Profit.Pomp, Triumph, Trophy, Pre-Eminence, Superiority.Spectacle, Pageantry, Paraphernalia. Reversed: Sincerity, Truth, Reality, Loyalty, Good Faith, Frankness, Artlessness, Candor, Romantic Overture, Unaffectedness.Liberty, Science, Freedom, Familiarity, Boldness, Ease, Dissoluteness. 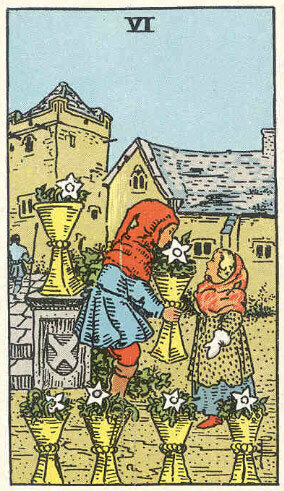 WAITE: The card speaks for itself on the surface, but other readings are entirely antitheticalgiving joy, mildness, timidity, honour, modesty. In practice, it is usually found that the card shews the decline of a matter, or that a matter which has been thought to be important is really of slight consequenceeither for good or evil. Additional Meanings: Marriage with a fair woman. Reversed: Great joy, happiness, feasting. Reversed Meanings: Perfect satisfaction. MATHERS: A fair Girl, Friendship, Attachment, Tenderness. Reversed: Gaiety, Feasting, Joy, Pleasure. ETTEILLA: Fair Girl, Honest Girl, Practical Girl, Honor, Propriety, Modesty, Restrained, Timidity, Fear, Apprehension, Sweetness [Mildness], Attractiveness. Reversed: Satisfaction, Happiness, Contentment, Gayety, Joy, Elation, Festivity, Entertainment, Feast.Apology, Atonement, Exoneration.Public Joy, Spectacle, Pomp, Dressing, Preparation, Arrangement. WAITE: Fairy favours, images of reflection, sentiment, imagination, things seen in the glass of contemplation; some attainment in these degrees, but nothing permanent or substantial is suggested. Additional Meanings: Fair child; idea, design, resolve, movement. Reversed: Desire, will, determination, project. 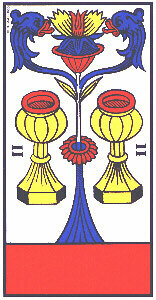 Additional Meanings: Success, if accompanied by the Three of Cups. MATHERS: Idea, Sentiment, Reflection, Project. Reversed: Plan, Design, Resolution, Decision. ETTEILLA: Thought, Soul, Mind, Intelligence, Idea, Memory, Imagination, Understanding, Notion, Meditation, Contemplation, Reflection, Deliberation, View, Opinion, Sentiment. Reversed: Project, Design [Plan], Intention, Desire, Will, Resolution [Decision], Determination, Premeditation. WAITE: A card of the past and memories, looking back, asfor exampleon childhood; happiness, enjoyment, but coming rather from the past; things that have vanished. Another reading reverses this, giving new relations, new knowledge, new environment, and then the children [see illustration, left] are disporting in an unfamiliar precinct. Additional Meanings: Pleasant memories. Reversed: The future, renewal, that which will come to pass presently. Additional Meanings: Inheritance to fall in quickly. llustration (above): Six of Cups, from an early edition (c. 1910) of The Rider Tarot Deck by Waite & Smith, published by Rider (from the private collection of Holly Voley). Click the image for a larger one. MATHERS: The Past, passed by, Faded, Vanished, Disappeared. Reversed: The Future, that which is to come, Shortly, Soon. ETTEILLA: The Past, Times Gone By, Wilted, Faded, Formerly, Earlier, Previously, Long Ago, In The Olden Days.Old Age, Decrepitude, Antiquity. Reversed: Advent, Future.After, Following, Subsequently, Later.Regeneration, Resurrection.Reproduction, Renewal, Repetition. WAITE: It is a card of loss, but something remains over; three have been taken, but two are left [see illustration, right]; it is a card of inheritance, patrimony, transmission, but not corresponding to expectations; with some interpreters it is a card of marriage, but not without bitterness or frustration. Additional Meanings: Generally favourable; a happy marriage; also patrimony, legacies, gifts, success in enterprise. 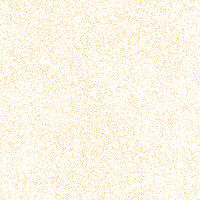 Reversed: News, alliances, affinity, consanguinity, ancestry, return, false projects. Additional Meanings: Return of some relative who has not been seen for long. 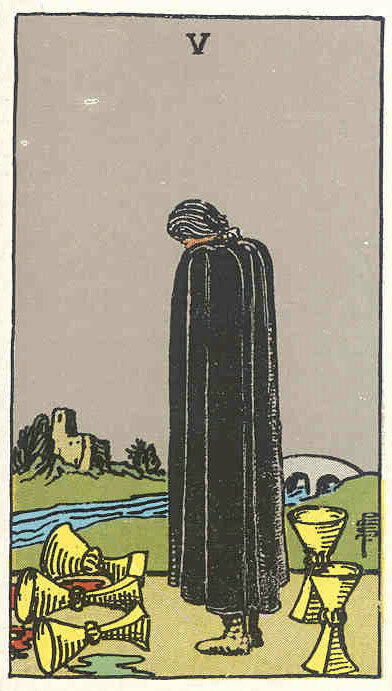 llustration (above): Five of Cups, from an early edition (c. 1910) of The Rider Tarot Deck by Waite & Smith, first published by Rider in 1909 (from the private collection of Holly Voley). Click the image for a larger one. MATHERS: Union, Junction, Marriage, Inheritance. Reversed: Arrival, Return, News, Surprise, False projects. ETTEILLA: Legacy, Succession, Bequest, Gift, Donation, Dowry, Patrimony, Handing Down, Will.Tradition, DecisionConspiracy. Reversed: Consanguinity, Blood, Family, Forbears, Ancestors, Father, Mother, Brother, Sister, Uncle, Aunt, Cousin.Filiation, Extraction, Race, Lineage, Alliance [Union].Affinity, Contact, Relationship, Connections [Junctions]. WAITE: Weariness, disgust, aversion, imaginary vexations, as if the wine of this world had caused satiety only; another wine, as if a fairy gift, is now offered the wastrel [see illustration, left], but he sees no consolation therein. This is also a card of blended pleasure. Additional Meanings: Contrarieties. Reversed: Novelty, presage, new instruction, new relations. Additional Meanings: Presentiment. MATHERS: Ennui, Displeasure, Discontent, Dissatisfaction. Reversed: Acquaintance, Conjecture, Sign, Presentiment. ETTEILLA: Weariness, Displeasure, Discontentment, Disgust, Aversion, Enmity, Hate, Horror, Anxiety, Mental Suffering, Mild Dejection, Vexation, Painful, Annoying, Unpleasant.Distressing, Troubling. Reversed: New Instruction, New Light.Sign, Indication, Conjecture.Omen, Presage.Premonition, Prognostication, Prediction, Novelty. llustration (above): Four of Cups, from an early edition (c. 1910) of The Rider Tarot Deck by Waite & Smith, first published by Rider in 1909 (from the private collection of Holly Voley). Click the image for a larger one. WAITE: The conclusion of any matter in plenty, perfection and merriment; happy issue, victory, fulfillment, solace, healing. Additional Meanings: Unexpected advancement for a military man. Reversed: Expedition, dispatch, achievement, end. It signifies also the side of excess in physical enjoyment, and the pleasures of the senses. Additional Meanings: Consolation, cure, end of the business. MATHERS: Success, Triumph, Victory, Favorable Issue. Reversed: Expedition of business, Quickness, Celerity, Vigilance. ETTEILLA: Success, Science, Fortunate Outcome, Happy Issue [Fortunate Ending], Victory.Healing, Cure, Relief.Fulfillment.Perfection. Reversed: Expedition, Dispatch, Execution, Achievement, End, Conclusion, Termination, Accomplishment. WAITE: Love, passion, friendship, affinity, union, concord, sympathy, the interrelation of the sexes, andas a suggestion apart from all offices of divinationthat desire which is not in Nature, but by which Nature is sanctified. Additional Meanings: Favourable in things of pleasure and business, as well as love; also wealth and honour. Reversed: [No primary reversed meanings provided.] Additional Meanings: Passion. MATHERS: Love, Attachment, Friendship, Sincerity, Affection. Reversed: Crossed desires, Obstacles, Opposition, Hindrance. ETTEILLA: Love, Passion, Inclination, Sympathy, Appeal, Proclivity, Friendship, Kindness, Affection, Attachment, Liking, Union, Gallantry, Attraction, Affinity. Reversed: Desire, Want, Wish, Will, Craving, Covetousness, Cupidity, Concupiscence, Jealousy, Passion, Illusion, Longing. 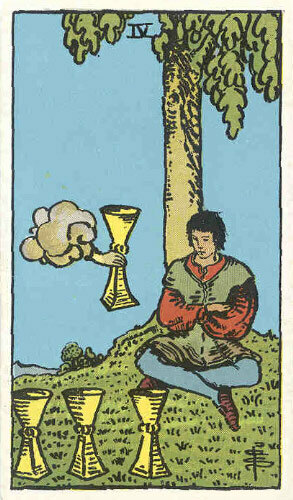 Illustration (above): Two of Cups from Ancien Tarot de Marseille (1932) by Marteau, Copyright &COPY; 1980 Grimaud. WAITE: House of the true heart, joy, content, abode, nourishment, abundance, fertility; Holy Table, felicity hereof. Additional Meanings: Inflexible will, unalterable law. Reversed: House of the false heart, mutation, instability, revolution. Additional Meanings: Unexpected change of position. MATHERS: Feasting, Banquet, Good Cheer. Reversed: Change, Novelty, Metamorphosis, Inconstancy. ETTEILLA: Table, Meal, Feast, Reception, Treat, Food, Edibles, Nutrition.Guests, Service.Invitation, Prayer, Supplication, Convoking.Host, Hotel, Hostelry, Inn.Abundance, Fertility, Production, Robustness, Stability, Steadiness, Constancy, Perseverance, Continuation, Permanency, Duration, Regularity, Persistence, Confidence, Courage.Scene, Painting, Image, Hieroglyph, Description.Tablets, Portfolio, Desk, Secretary.Simple Table, Bronze Table, Marble Table, Law.Catalog, Table of Contents.Sounding Board, Garden Table, Holy Table. Reversed: Mutation, Permutation, Transmutation, Alteration, Vicissitudes, Varieties, Variation, Inconstancy, Weakness.Barter, Exchange, Purchase, Sale, Deal, Treaty, Agreement.Metamorphosis, Variety, Changeability, Reversal, Disruption, Revolution, Reversion.Version, Translation, Interpretation.